Not aliens. Just a well armed family. It took three seasons but we finally got it. A god dang alien on a show about aliens invading god dang earth. God dang this is great! 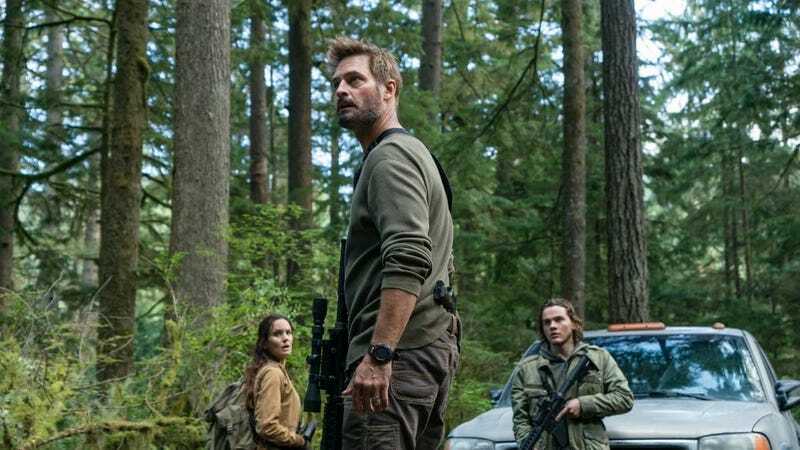 Colony—about a family struggling to survive on an Earth colonized by aliens who seem to use humans themselves as a natural resource—has had a bad habit of teasing its aliens without actually showing them. Instead it’s shown us drones and mechas that can turn people to gory red mist with a glare. The aliens, and all of their reasons for being here, have remained pretty mysterious. Two episodes ago the show teased us again, giving us a glimpse of a gelatinous mass in a space ship. It was hard to make out anything beyond a panicked prop designer’s ingenuity, and was, in fact, kind of irritating. The alien wasn’t just poorly shown, it was also not even representative of the aliens that are the focus of the show. Instead, the characters suspected it was from another faction in a war. This is not an alien! This is goop! This theory was confirmed this week when we saw our first full shot of one of the colonizing aliens. And it is... a robot. Now THIS is a proper alien. Yes, robots have invaded Earth and are using humans as labor to build weapons to be used against the goo aliens. This was hinted at in the season premiere and is only a little revelatory. What’s shocking: The alien’s insistence that the human-alien relationship is a collaboration. Up until this point, the assumption has been that the aliens are callous colonizers who view humans as “savages” that are to be corralled, enslaved, or both. Whether this particular alien is too low down the pole to know what’s happening to the human race, or the robo-aliens have a different view of equal partnership, remains to be seen. Either way the world of Colony has just expanded on a stellar scale and it’s going to be pretty hard to hide the aliens going forward—which is totally okay by me. Why would aliens come all this way just to invade Earth? What&apos;s Your Favorite Driving Video?